Diverse and abundant wildlife are central to Alaska’s economy and people. Over 1,000 vertebrate species are found in the state, sometimes in huge numbers. More than 900,000 caribou roam in 32 herds across vast tundra landscapes. On the Copper River Delta alone, five to eight million shorebirds stop to forage and rest each spring on their way to arctic breeding grounds. Alaska has 32 species of carnivores, more than any other state. Most of Alaska’s fish and wildlife populations are considered healthy. In the rest of the nation, more than 400 species are listed as threatened or endangered. In Alaska, only 20 species are listed this way. Life history, range, habitat, uses, and more. Which ones to look for, how to report, negative impacts, prevention & more. What you need to know about bringing any kind of animal into Alaska, or keeping a wild animal as a pet. Endangered, threatened, extinct and other species of concern. Safety around wildlife; attracting and deterring animals; wildlife and pets; contacts and more. 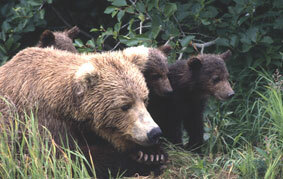 Learn about diseases common or important to Alaska's wildlife. Alaska's species conservation plan and how to become a partner. Brown bears have an exceptionally acute sense of smell, exceeding that of dogs.